Avocado is considered excellent for skin and hair. It contains essential nutrients and fatty acids that moisturize your skin and help reduce wrinkles. Moreover, it protects the skin from environmental damage. Avocados are packed with vitamin A, vitamin C, vitamin E, vitamin K, magnesium, potassium, and phosphorus. You can derive the benefits of this fruit by eating as well as applying it. It keeps your skin young and supple. Application of avocado oil is particularly useful for soothing dry skin as penetrates deep into the layers of skin. Moreover, it makes your skin soft and heals sunburns because it is high in sterolins. • Scoop out the pulp of half an avocado and add one tablespoon each of plain yogurt and honey (heat the honey slightly beforehand to reduce its viscosity) in it. Mix these ingredients well to form a smooth paste and spread it on your face. After 15 minutes, wash it off with lukewarm water. It nourishes the skin, treats wrinkles, and refines the pores. • If you have extremely dry skin, consider applying a mixture of an avocado and one tablespoon of extra virgin olive oil, sweet almond oil, or jojoba oil to replenish dull skin. You may use a combination of avocado pulp and organic avocado oil, too. • Add one teaspoon of lemon juice, one teaspoon of olive oil and half a teaspoon of orange juice in avocado pulp and smear this mixture on your face and neck. Rinse it off after about 20-30 minutes to remove dead skin cells. • Those of you who have oily skin can also prepare a nourishing homemade skin care recipe with this fruit by blending an egg white and one teaspoon of lemon juice along with mashed avocado pulp. Leave this paste on your skin for almost 20 minutes and then wash it off with warm water. • Make an exfoliating face mask by mixing one teaspoon of honey and half a teaspoon of apple cider vinegar in mashed avocado fruit. Apply this mixture on your face for 15 minutes. Finally, rinse it off with warm water followed by a splash of cold water. You only need half an avocado for this recipe. Check out this video showing how to make and apply an avocado face mask for dry skin. • Take half an avocado, half a cucumber, one tablespoon of aloe vera gel and an egg yolk. Blend all these ingredients together in a blender and apply the resultant mixture on your skin to soothe dry skin, cure age spots, and reduce sunburn naturally. • Cook a carrot in boiling water for about 15-20 minutes and then peel it. Next, put this carrot, avocado pulp, three tablespoons of honey, one tablespoon of olive oil, and half a cup of heavy cream in a blender and puree them. Apply this paste on your face and neck for 15-20 minutes. Finally, wash it off with lukewarm water followed by a cold water rinse. 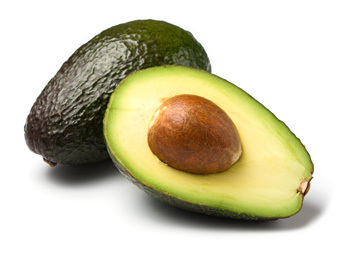 • Simply applying avocado pulp on your skin helps reduce itching and inflammation caused by eczema. You can use it on your hair as well to maintain healthy hair. • Prepare a homemade avocado hair mask for dry hair by blending a banana, half an avocado, three tablespoons each of olive oil and buttermilk, two tablespoons of honey, and a whipped egg. Leave this mixture in your hair for half an hour and then shampoo as usual. Follow this procedure about two times in a month. • Another simple avocado hair care recipe involves making a creamy paste of ripe avocado pulp, one tablespoon of organic olive oil and the same amount of honey. You may also add a few drops of rosemary essential oil in it. When preparing avocado face masks, it is suggested that you mash avocado pulp in a small bowl until it becomes creamy and then add other ingredients in order to get a smooth mixture with no lumps. You may use a fork or potato masher to mash the fruit easily. It’s not a must, but if you choose to use foundation, opt for one that will allow your skin to breathe and one that won’t looked caked on. Mineral makeup can be a good option for those with sensitive skin as long as it doesn’t contain ingredients that might inflame or irritate your skin.